Mobile Connect Authenticate: Single factor level of assurance (LoA2). 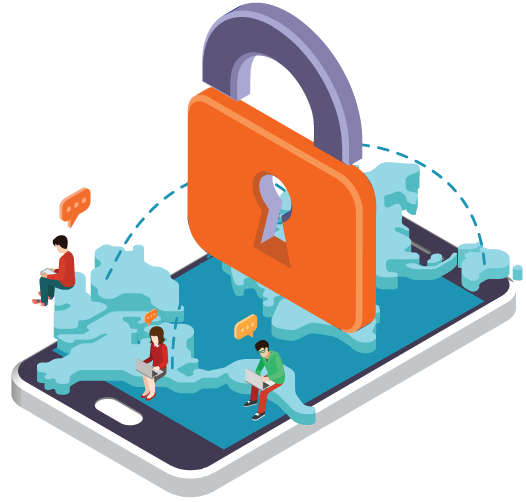 When a Digital Services Provider (DSP) receives a Mobile Connect API request from an application, it simply has to confirm that the end user isin possession of their mobile phone. Mobile Connect Authenticate Plus: Two-factor level of assurance (LoA3).Requires end user to confirm he/she is in possession of their mobile phone; then, when prompted, to enter a PIN. The Digital Service Provider identifies the serving operator and requests end user authentication. To prove possession of the mobile phone, the DPS challenges the end user and offers the option of entering a PIN. The end user confirms one or both accreditation factors on their mobile phone. The application provides authentication success or failure response back to the DSP. Tom wants to use the Wi-Fi in a new coffee-shop he’s trying out. There’s an easy way and a tedious way. The shop’s portal requires Tom to create an account, devise a username and offer up yet another password. Around 90% of customers drop the whole idea when this happens. Tom has an easier way. He opens his Mobile Connect app, enters his phone number, and gets a prompt to confirm that he wants to log on to the Wi-Fi. With a simple tap, he’s up and running; no usernames, no passwords, no tedium. Tom’s happy because it’s all intuitive and quick. He will return. The outlet’s happy because they have demonstrated best practice and will now gather more data insights from a returning customer. Rithika is logging into her bank from a public computer in a hotel lobby. Because this computer is unknown to her bank, 2-factor authentication is required, involving an Interactive Voice Response call-back to the actual phone Rithika registered with the bank (her home phone). She doesn’t have it with her. No problems; she uses Mobile Connect with her PIN to access the site. The result is not just that Rithika gets the job done with no hassle, but she also trusts her bank and appreciates global access to her finances. Self-service authentication drives a seamless and swift customer experience. It’s a welcome process for customers and a cost-saver for the bank as it avoids the cost of the Interactive Voice Response.